Galaxies are not static islands of stars—they are dynamic and ever-changing, constantly on the move through the darkness of the Universe. 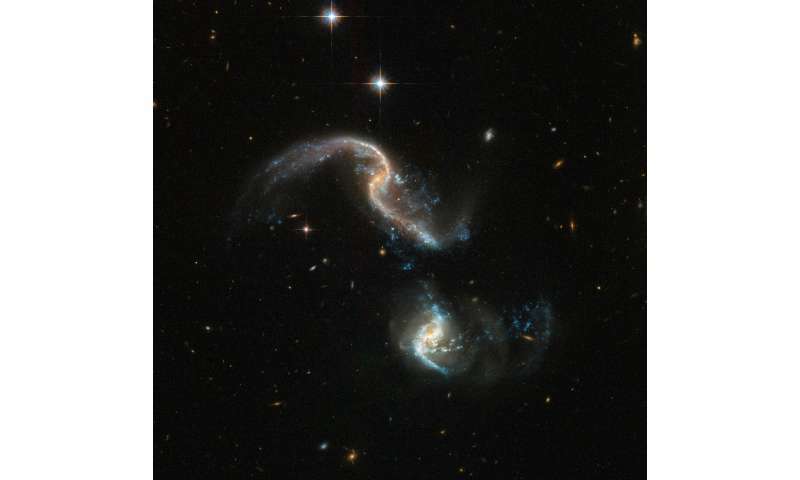 Sometimes, as seen in this spectacular Hubble image of Arp 256, galaxies can collide in a crash of cosmic proportions. Though their nuclei are still separated by a large distance, the shapes of the galaxies in Arp 256 are impressively distorted. The galaxy in the upper part of the image contains very pronounced tidal tails—long, extended ribbons of gas, dust and stars. Many galaxies in this catalogue are dwarf galaxies with indistinct structures, or active galaxies generating powerful jets—but a large number of the galaxies are interacting, such as Messier 51, the Antennae Galaxies, and Arp 256. Such interactions often form streamer-like tidal tails as seen in Arp 256, as well as bridges of gas, dust and stars between the galaxies.